Botulinum toxin, commonly known as BOTOX, is a synthetic chemical that can be used to block nerve signals for treatment of a wide range of conditions. Although most commonly known for its cosmetic purposes, BOTOX injections offer an effective treatment for many medical conditions, including muscle spasms and movement disorders such as blepharospasm, which causes patients to blink uncontrollably and tightly close their eyes. The cornea is the clear covering of the front of the eye that bends, or refracts, light rays as they enter the eye. For clear vision to occur, the cornea must have the correct shape and clarity to focus incoming light rays precisely on the retina at the back of the eye. Corneal exams are important because they can determine whether any distortions exist in this portion of the eye. A computerized test called corneal topography can map out the surface of the cornea, alerting your doctor to the presence of inflammation, scarring or astigmatism. 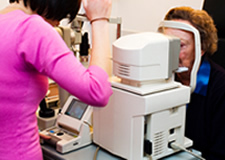 This exam can provide information about the health of the cornea and is a valuable diagnostic tool prior to a contact lens fitting, vision correction procedure or corneal transplant. Diabetic-related eye problems develop from high blood sugar levels, which can cause damage to blood vessels in the eye. 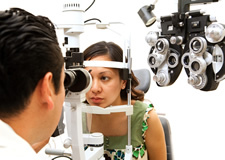 More than 40 percent of those with diabetes will develop some form of eye disease in their life. The risk of developing eye problems can be reduced through regular eye exams and by keeping blood sugar levels under control through a healthy diet and regular exercise. Dry eye is a common condition that occurs when the eyes are insufficiently moisturized, leading to itching, redness and pain from dry spots on the surface of the eye. The eyes may become dry and irritated because the tear ducts don’t produce enough tears, or because of a chemical imbalance in the tears. Patients with dry eyes often experience irritating symptoms that may result in more serious damage to the vision if the condition is left untreated. Treatment for dry eye depends on the cause and severity of the condition, as well as the patient’s overall health and personal preference. Non-surgical treatments are often effective, and may include increasing humidity levels at home or work, use of artificial tears or a moisturizing ointment and avoiding air conditioning or windy conditions outdoors. One of the newest, most technologically advanced methods of treating severe dry eyes is the use of intense pulsed light (IPL) therapy. These incredibly precise devices can be used to deliver powerful pulses of light energy to treat the abnormal blood vessels that are resulting in a malfunction of the meibomian glands in the eyelids, which are a primary cause of dry eyes. Our practice is on the cutting edge in dry eye treatment by employing IPL therapy, and we are seeing successful results. We opt to use broad band light (BBL) through the Skintyte II by Sciton to safely and effectively heat the affected blood vessels of the eyelids. As they shrink, the glands resume normal function once again and the dry eyes are resolved. Hyperthyroidism, also known as an overactive thyroid gland, involves an excess of hormone production that can lead to weight loss, irregular heartbeat and irritability. One of the most common reasons for an overactive thyroid gland is Graves’ disease, an autoimmune disorder in which antibodies cause the thyroid to produce too much thyroxine. This condition may cause symptoms within the eyes such as bulging, excess tearing, swollen eyelids and light sensitivity. If symptoms are mild, conservative treatment may be attempted using lubricating eye drops, protective eye coverings and prism lenses. Oral steroids are sometimes prescribed for short-term use to relieve swelling and discomfort. In more severe cases of thyroid eye disease, surgical treatment may be recommended. Depending upon the way the condition is affecting the eyes, procedures may be considered to relieve the pressure on the optic nerve, reposition the muscles of the eye or alter the eyelid skin and tissue.